Water leaks don’t respect business hours. Even if they occur between the hours of 9-5 when people are more likely to be in the building and respond to them, there is a good chance they can go unnoticed. A small leak left unattended over a 4-day weekend can result in a flood before people return to work. It is very important to notice if there are any water leaks in your home or business and react to them immediately or the damage will get much worse. Follow these suggestions to recognize the early signs of a leak so you can stop them before they can cause problems. Small plumbing issues, like leaking pipes or a “running” toilet, can turn into expensive problems if they sit for even a few days. Luckily there are several inexpensive ways to find small water leaks, so they can be dealt with quickly during business hours, so you can avoid after-hours charges or worse, flood damage on Monday morning. Be alert for the sound of running water from sinks and toilets, especially when the water should be off, such as after the toilet tank should have refilled from flushing. If you hear any drips or running water, there’s a good chance of a problem that needs professional attention. It’s easy to ask staff members to get into the habit of paying attention to the sinks and toilets and this ensures problems will be caught immediately. Faulty seals can be repaired easily and inexpensively, but left unattended long enough, an overflowing toilet will cause damage to the surrounding floor. Have your staff members do a quick inspection around their workspace once a week to check for damp spots on ceilings, walls, or carpets. A trail of wet spots through a workspace can lead to a broken pipe. Make sure someone checks common areas like restrooms and break rooms or kitchens; these two areas are at the highest risk for water damage. If someone mentions a drop in water pressure, take it seriously. This can be a sign that water is leaking somewhere in the building. Encourage staff members to report any changes in anything to do with the normal day to day operations of the building, no matter how small. One person may think a problem is minor, but if five people report the same problem, it’s not minor. Install water detector sensors throughout the building. These sensors monitor their immediate area and sound an alarm if water is detected. This helps pinpoint the exact location of the excess water. Make sure to have water detectors installed in computer server rooms, records rooms, and other places that are extremely sensitive to excess moisture. It won’t be ideal to have a damp break room, but a wet server room can shut down your business for days or longer for flood damage cleanup. If you find a leak, it’s important to act quickly to stop the spread of the water and limit the damage. Mold begins to grow within 24 hours of exposure to excess water, so it’s vital to have a water damage cleanup plan in place for your company. Turn off the water to the affected area immediately. This keeps the situation from getting worse until the problem can be repaired. Turn off the water to just the affected fixture if possible, or the entire building if necessary. Learn how to turn off the water before there’s a problem. If you turned off the water and it’s still coming out, call a licensed plumber immediately. There are many who have 24-hour response numbers, and this may be a good one to have programmed into your cell phone’s contacts list. Move files and other important assets, such as computer equipment, to higher ground. It’s suggested that records should be stored electronically, with copies stored off site, in the cloud or in two different physical locations. If you’re concerned about cloud storage being hacked, there are personal cloud storage options available for sale, separate from public ones like Google Drive or Dropbox. Develop a contingency plan for staff workplaces in case the office is unusable for a few days. Options include working out of rented office space or telecommuting. This is useful not only in case of floods, but for any disaster, such as a fire or blizzard. No matter how water got inside your home or office in Northbrook, Wilmette, Glenview, Highland Park, Lake Forest, Evanston, Winnetka, Buffalo Grove, IL or the surrounding areas, you need it gone fast. 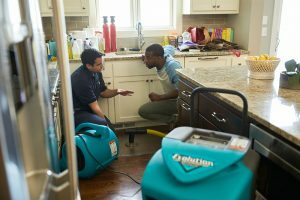 Call the highly trained experts at ServiceMaster DAK for expert water damage restoration services to remove all traces to excess water before it can ruin fragile electronics and other delicate items. We’ll clean, sanitize, and restore damaged areas before mold has a chance to grow and ruin more content. Restoration costs vary, depending on the extent of the damage and the amount of restoration needed.